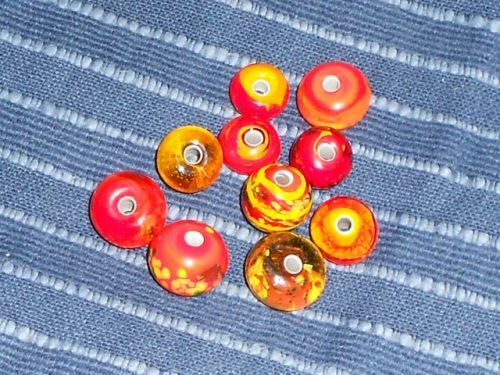 As Ze Barnacle showed an interest, i'm gonna try my best to do an intro to Glass Bead Making, also known as Lampwork as it's done via a blowlamp/torch to provide the heat. First off, i've done this with pro's where the workshop and equipment was already set up, so i cant offer a tonne of advice on types of lamp/torch, the fuel mix, temps etc etc but i'll provide links for further exploration by those who are interested. Secondly, safety: Always wear safety glasses - the glass can shatter due to contrast in temperature and eyes are hard to replace. Also, Blow lamps can cause burns and fires quite obviously, i take no responsibility for what folk burn and please have your noggins switched on and fire extinguishers/local burns unit telephone number handy etc etc. Stay safe. Check out these vids first, my attempts to describe and explain the process will make more sense after these i promise. I dont have any photos of myself at work to illustrate the process and own no bead making gear myself, having done it in a prof's workshop etc. The vids show some excellent makers doing some stuff that aint for the beginner, but the start of the process is how you make a basic bead, the rest is just gravy, and i'll answer any questions as best i can. However, the basic process is very simple and logical once learned, and phenomenally absorbing and rewarding. 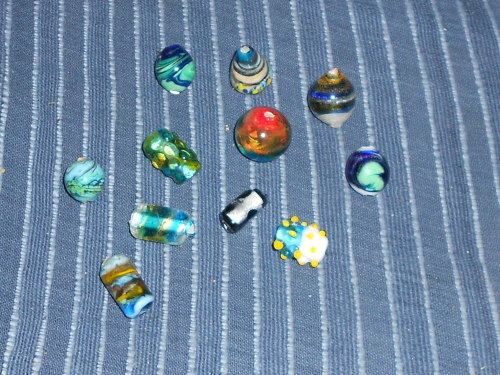 For reference, here is the wikipedia page on Lampworking, and these guys supplied glass to the beadmaker i knew. I expect that a variable temp blowtorch would work fine as long as you can clamp it to a workbench like in the vids, but i have no idea about recycled glass - i suppose it would be fine, but just experiment with caution. Firstly you need the metal rod to wind the glass around - it's called a mandrell and the grey stuff on the end is called "release paste" - this is where you wind the glass, and it makes it easier to get the glass bead off when it's cooled, so it does not stick to the metal. Glass normally comes in rods. you need to heat the end of the mandrell, while slowly buildiong up the heat at the end of the glass rod so they are both similar temps - do this by dipping the end of the rod in and out of the flame gradually. Heat the glass too quick and it will shatter. When it starts to glow and get molten, touch it to the mandrell and wind it around untill you have a suitable sized blob on there. From here on in, the mandrell needs to be kept turning or gravity will mean the blob of molten glass just droops untill it falls off. That is enough to make single-coloured bead. Continuous rotation in the heat will make the blob into a consistently round shaped bead. Now you need to take it out of the heat for a few seconds to cool a little, then flash it back in, in, out, in, out so it is no longer a glowing molten ball and cools a tiny bit. Then pop it into a bowl full of vermiculite to insulate the bead so it cools very slowly and does not crack. Only the bead needs to be buried, not the whole mandrell. A few hours later, just twist and pull off - you may need to use pliers or a vice to hold the mandrell as you twist the cooled bead off of it. Of course you can add other colours/opacities (did i invent that word? i mean clear glass, opaque glass etc) while making it, or roll it in "frits", ie: powdered glass or shards to melt in and make spots. Thinner strips/threads of glass can add stripes of colour. You can roll it on a flat or bumpy/textured heat proof surface (a graphite marver, or even a flat bit of slate) to help shape it, or add texture. You can also use tweezers to pull the molten glass into groovy shapes. You can make the thinner threads of glass for stripes simply by heating a rod and pulling threads off with tweezers to make it thinner and so on. I probably watched the professional at work for ten minutes before picking the basics up really easily - there are loads of good Youtube vids to help out. 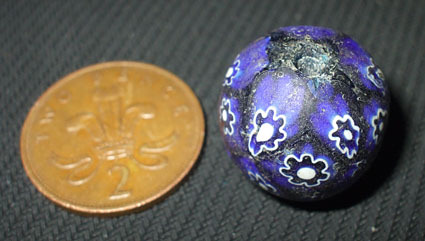 the pictures below are 2 beads I found - the simple blue one is Roman and the other is hard to date but I think it is quite modern, both were found on fields while metal detecting. I have seen samples of glass made from beach sand from different beeches around the country and around the world too - it all has differing shades/types of blues and greens depending on the mineral content, but i dont know if it was melted as is, or if other minerals were added like sodium (?) etc. Given that our ancestors were cooking rocks for knapping as early as 160kybp, and that beaches and rocks are also good places for forges; they will have noticed the effects of heat on crushed rock and then doing it on purpose is the next step - it's maybe a surprise that we dont see glass being made earlier that we have evidence for. With a little experimentation making glass aint really so hard at all - you can even do some glass work in your microwave iirc... i'll have to look it up but i'm sure i remember seeing some links/vids on the subject. Those finds are fantastic too - i've seen ones modern ones with just the same pattern as that second one, i have no idea as to the age of yours or that type of design though. 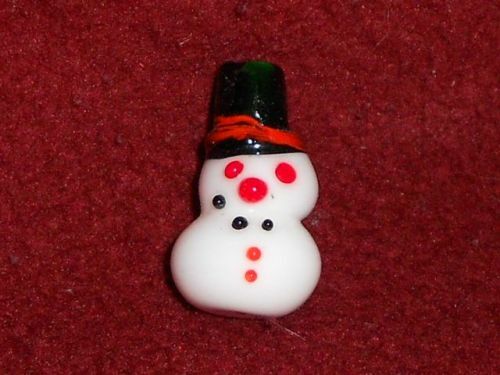 Bead making is totally hypnotic once you get started - you focus all your attention on such a small area, controlling heat and rotation and watching the colours blend and swirl and so forth. You can really let your imagination run free with the colours and shapes once you get the hang of it. 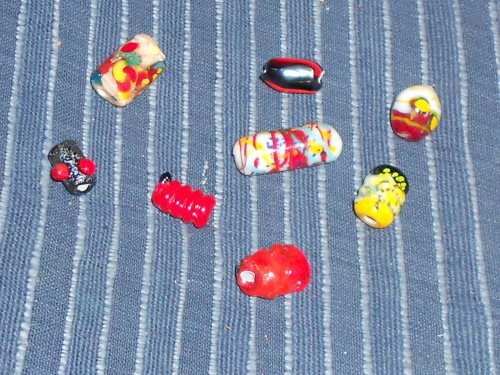 Here are a few others, for reference the red-ish ones pictured earlier and The Snowman were the most recent ones i did, but i've probably spent no more than two or three days bead making, it's easy to pick up once you're under way though of course having an expert on hand whose brain i could pick was invaluable. Mr. B your blue glass bead looks like a Saxon one to me, but Roman beads are very similar, also I've seen a few Iron age beads which are close, v. rare though. The other with the white flowers does look modern to me, was there any Roman pottery/metalwork from the same field or just on it's own? The Romans made glass bowls with a similar design. It's quite possible that the second one is old with a common/well known design, and that the pattern is copied in modern work. The first is ancient, it does have that feel. and saxon finds do turn up on roman sites, and the saxons where recycling roman glass too. Hmm..